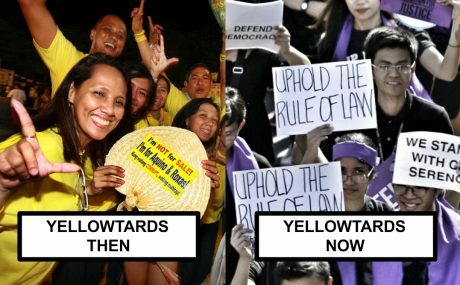 Why do Yellowtards no longer wear the colour yellow in their rallies? May 10, 2018 - by benign0 - 7 Comments. It’s a mystery. Not too long a time ago, the colour yellow was worn by Yellowtards with pride in their political events and protest rallies. Suddenly the practice stopped. In fact whenever leaders of the Opposition organise and call for a rally or some sort of political action nowadays, they even issue clear instructions to “wear white” or some other colour — except yellow. Has the colour yellow become a taboo colour in Philippine Opposition politics? The concept that yellow had become taboo boggles the mind considering how, for more than three decades, the colour yellow was regarded by many Filipinos as a symbol of all in politics that was good. Why do you Yellowtards now seem to shun the colour yellow? Perhaps it is because the typical Yellowtard would likely answer in a not-so-straightforward manner or would simply outright refuse to “dignify the question” with an answer. That’s pretty typical of a Yellowtard, to be fair. A Yellowtard would be offended by what is otherwise a pretty valid question. One’s perfectly sensible curiosity is met with a baffling defensiveness. This could be the reason why the question may never be answered — because Yellowtards themselves couldn’t be bothered to confront the reality of why the colour yellow no longer rocks. Even more disturbing, it could be a sign that Yellowtards are incapable of evolving. The journey towards a enlightened state often starts when one is willing to answer the hard questions. The change in choice of political colour amongst Yellowtards seems to have been driven from within their ranks. Yet, because they have long shown an inclination to externalise the perceived causes of their problems, they fail to consider that, perhaps, there is something about their very nature that contributes to the failures they’ve been experiencing in recent years. In their monomanic focus to find the roots of their problems elsewhere they fail to find the solutions that could easily come from within them. Tragic indeed. Previous Article Mahathir Mohamad set to turn Malaysia back into a REAL southeast Asian nation! Yellow was the color of the Chinese Emperors of the old, in China. Nobody else can wear the color, except the Chinese Emperor. The late, Cory Aquino, who herself was of Chinese descent, choose the Yellow color, to make herself and her family, a Filipino royalty, like the Chinese Emperors. Unfortunately, the Aquinos did not deliver their promises to the Filipino people. Instead, the Aquino era was full of: graft, corruption, massacres, lawlessness, political patronage, shabu drug proliferation, narco politics, etc…her son, Pnoy Aquino, who is mentally retarded and suffering from depression, became our President. Besides, some of the social media people, began to call the Aquino followers: YellowTards. It means , they are followers, who are , Mentally Retarded and are Wearing Yellow shirts. Who would want to be associated with mental retardation ? Whoever started calling them :YellowTards, did a vicious name to them. Whether, the name is appropriate or not. Is is you to decide. Whatever color you wear; we don’t care. It is what you can do for us and for the country; that we are interested. Not your color, but your Brains, and Political Platforms to solve our country’s problems ! is the color yellow already been rejected by the pilipino people? Yellow is a color of cowardice, no wonder the same meaning reflect their character. Perhaps it’s because the cause for rally isn’t about the LP? Also, perhaps it’s because, as I’ve been saying since time immemorial, that the yellowtards do not comprise the majority of the Opposition. Come election time, I guarantee, the yellowtards will wear yellow again. To all you G-D-SOB Yellowtards…Look around you. Everything changes. Everything on this earth is in a continuous state of evolving, refining, improving, adapting, enhancing…changing. You people were not put on this earth to remain stagnant. They, the Yellows, just would not accept the fact that they are no longer relevant, whatever color they assume. They still persist in their line of thought that the more visible they are, and as loud, they would matter ever, just like a falsity that becomes truth eventually because they are simply there, being horrifically prolific but acknowledged, given noticed and glorified. Stop all these brouhaha about them ant they will die a natural death.